Binary Newsgroup Search Engine, Search Newsgroup Picture Sound file etc. Binary Boy is a yEnc and NZB compliant Usenet newsreader and Newsgroup Search Engine that searches internet newsgroups for pictures, sounds and other files matching your search criteria and makes newsgroup downloading fast and convenient. Binary Newsgroup Search Engine - Binary Boy searches internet newsgroups for pictures, sounds and other files matching your search criteria. You can search the internet newsgroups by using AND, OR and NOT. 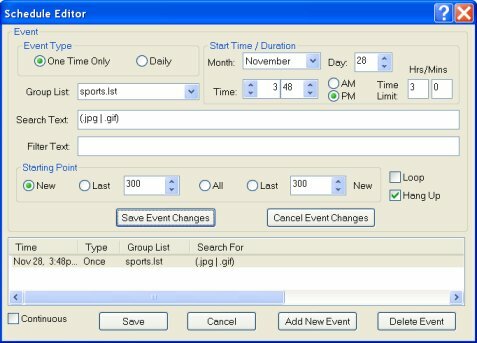 Example: ".jpg" AND (car OR cycle), and it can search and filter globally, within a list of newsgroups, and specific to a single newsgroup. Most internet service providers run a news server. Check your documention for the news server address. Usually it's something like news.yourisp.com ! Find missing parts or files from other Binary Boy users who are online. Unattended scheduled searches so you can download while you sleep. Searching and filtering globally, within a list of newsgroups, and specific to a single newsgroup. Reassembles UUencoded files split across several articles or even across multiple servers. Click the Settings toolbar button and make sure the information under the Server and Dialer tabs is correct. Binary Boy won't work without knowing the server address. A list of newsgroups is included in the distribution, but it is incomplete. You can refresh the newsgroup file by clicking on the Newsgroups toolbar button. Binary Boy requires a group list to search. A sample list named sample.lst is included but you will probably want to create several of your own. You can create a group list by clicking on the Group Lists toolbar button. Click the Search toolbar button and fill out the search dialog to start searching. Try searching for .jpg OR .gif to find pictures. Check the Auto option for an automated search or uncheck it to browse manually. eSpyNow - eSpyNow is an award-winning, critically acclaimed and easy to use spy software for home or office. Hot! 2 Find MP3 - 2 Find MP3 is the ultimate tool to locate and retrieve MP3 files on the net.